Vague memories of a Matt Helm movie as played by Dean Martin or some square-jawed male star from the Sixties. If I recall, the film was sexist and dimwitted. Maybe my memory fails. Maybe it was a TV thing, not sure. Hamilton’s books are sure to be better. Donald Hamilton was a good writer. A journeyman and a pro. A WWII vet. Started his paperback writing with Westerns, as did Elmore Leonard. This novel in the Helm series (often recommended as the best one) doesn’t exactly start with a sizzling pace. Several chapters in, everyone is still hanging around the same dinner party that began the book. The narrative voice is first person repetitive, sometimes overstated. It came with the times. Back then, commercial writers made sure everyone got it. But as the beginning dragged on, I wondered: Have things always been so damned exciting in New Mexico? Not all is torpid. The descriptions of the “secret organization” are entertaining. You know, that secret organization to which Helm and the pretty gal in the black dress at the party are committed. This is the pretty gal who he just happens to encounter after all those years and who he had big espionage adventures and a roll in the hay with and who now taunts him with her beauty and darting eyes right in front of his wife. And there are engaging scenes between man and wife. One notable moment occurs when the narrator’s description of how, in general, a lady always looks better after a party when she’s a bit worn out. 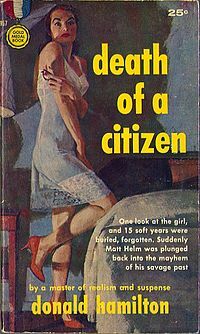 This is about the extent of the suspenseful action in the opening fifty pages — until a woman (the citizen we assume) is found dead in Helms’ place, and he is set up. Posted in booknotes on June 8, 2013 by Wm P.